I believe I linked through to the (now defunct) website for these giant guitars in the very early days of this blog. I had wondered what had become of these giant guitars (there was a Strat and a Tele) and now it seems that the Strat has turned up on eBay. I'm not sure of the builder's name (he's Ujaxman on Mice Pace and YouTube) but he hand-built the giant Tele and Strat and has been lugging them to festivals and special events all over the USA for over 10 years now. Fender even granted permission for the Fender name to be used on the headstocks - and let's face it, these guitars were made in the USA unlike so many Fender guitars these days. The giant guitars aren't to be confused with guitar sculptures or giant guitars on roadside signs - they are fully functional electric guitars and are playable - and if you don't believe it, check the video. 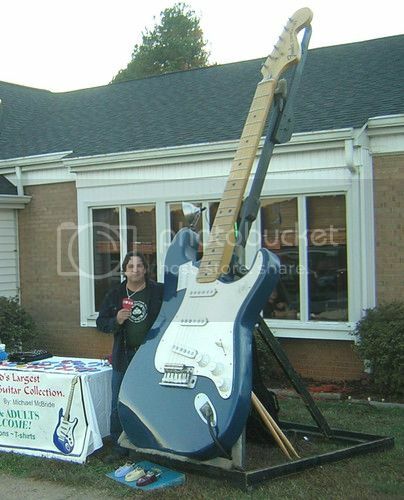 Anyway, claiming he can always build another one, Ujaxman has listed the giant Stratocaster on eBay. It's yours for $72,999! G L Wilson © 2012, Guitarz - The Original Guitar Blog - now in its 10th year! Nice idea...But where do you get replacement strings?